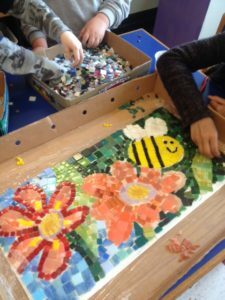 youth ranging from Kindergarteners to fifth graders in designing and creating four mosaic panels to decorate their schoolyard garden. 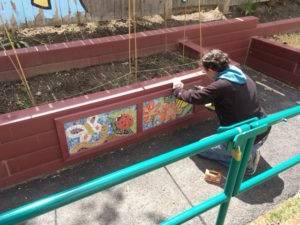 The panels show some of the plants and animals that can be found in a healthy urban garden like the one in their schoolyard. The garden is located in the school’s playground and is used for lessons that connect to curriculum for many different grades. 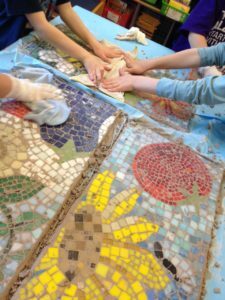 While the group’s initial design ideas could have filled many more panels, the mosaic artists quickly learned how much time it takes to piece together an image out of small tiles, and we limited ourselves to four. The glass tiles that we used were donated by the Beautiful Stuff Project.